“Bruce Armstrong’s name is synonymous with current sculptural practice in Melbourne.” Boasts John Buckley Gallery’s website. 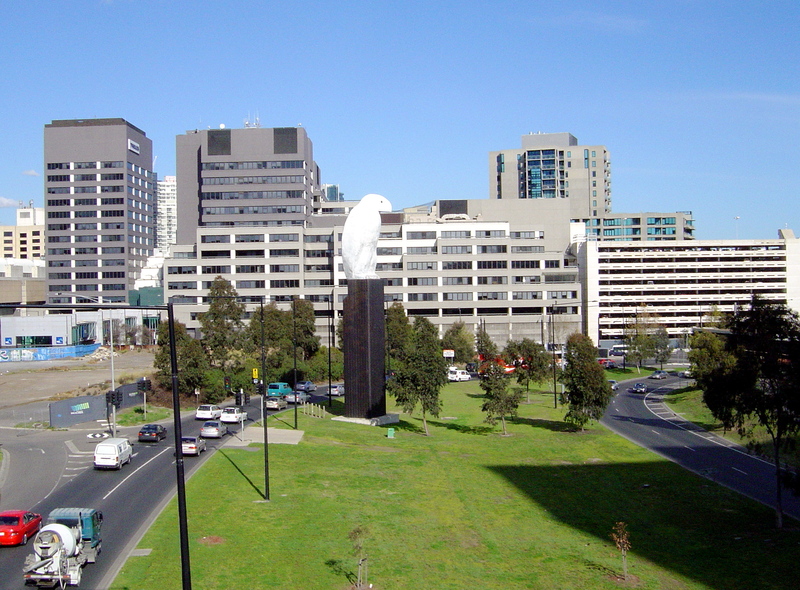 There is good reason for this boast Armstrong’s sculpture Eagle (aka “Bunjil”) erected in May 2002 at Bunjilway is now an iconic image of Melbourne. However, Bruce Armstrong is hardly a household name. Bruce Armstrong was born in Melbourne in 1957 and studied painting and sculpture at the Royal Melbourne Institute of Technology (RMIT). He has sculptures in Melbourne, Sydney, Perth and Canberra. In the 2005 Armstrong was an Archibald Prize finalist with a self-portrait with eagle. 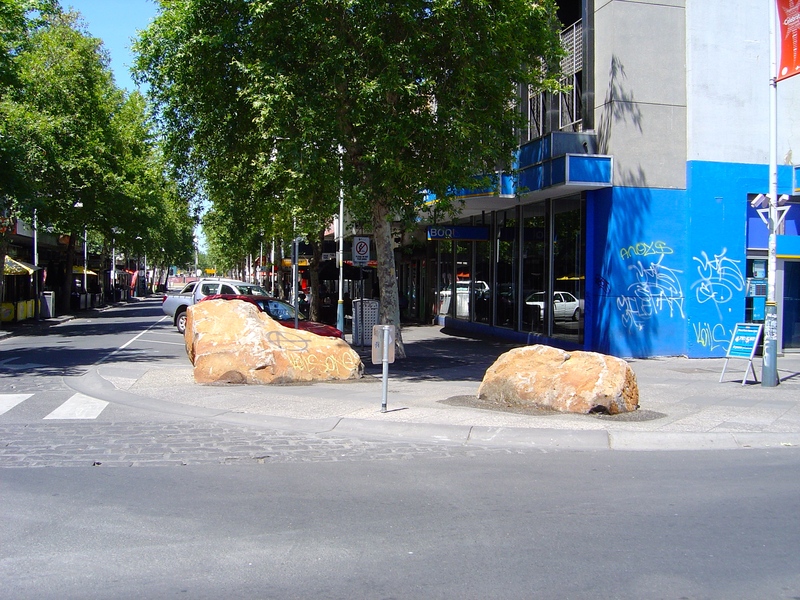 “Bunjil” is not an isolated work Armstrong’s sculptures have been around Melbourne for decades. There are two more of Armstrong’s eagles, “Guardians”, 2009 out the front of the Grand Hyatt Hotel on Russell Street. At Yarra Turning Basin there is a series of angled pillars, Armstrong’s “Constellation”, 1997, made in collaboration with Geoffrey Bartlett. 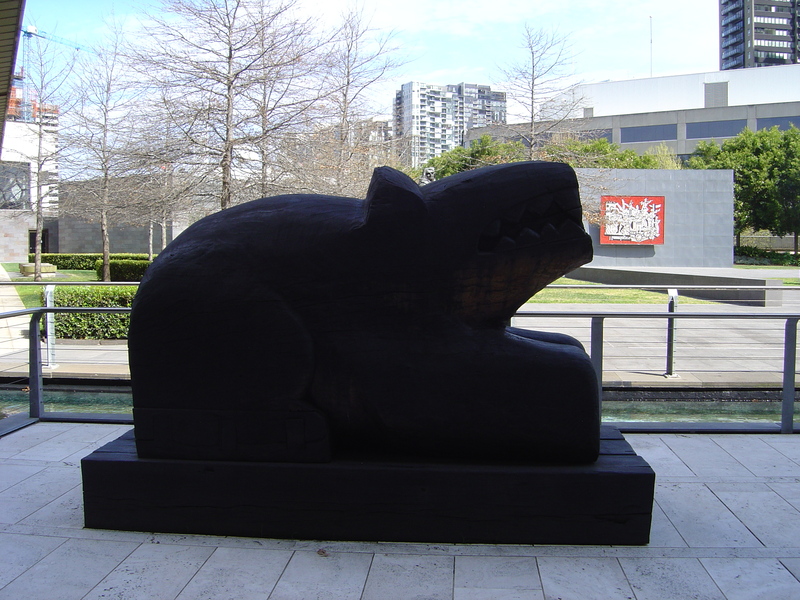 His “Tiger” 1985 is out at Heide Museum of Modern Art. Armstrong’s two lions beasts (Untitled 1986) once guarded the front of the National Gallery of Victoria but are now out the back in its sculpture garden. When Armstrong’s two lions untitled beasts were out the front I overheard a man and woman from the country who were looking at them. “I reckon I could do that with my chainsaw” the man remarked. I’m sure he could be I doubted that he would make the effort to move such enormous logs and do all the carving. The muscular nature of the sculpture is part of what makes Armstrong’s work powerful, the monumental physical displays of power. 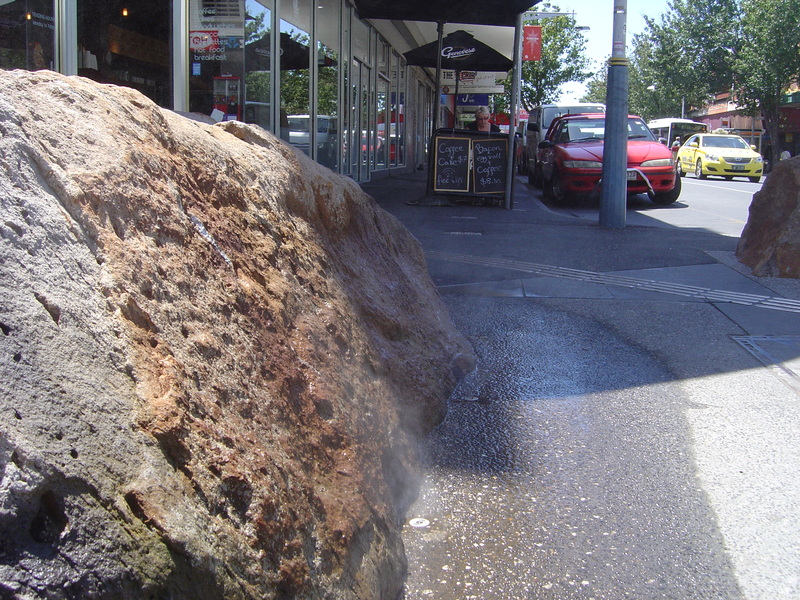 There is an unrefined power to the statues of Bruce Armstrong, the large lumps of materials from which they are carved are still visible. His huge animals are usually carved from native red gum and cypress although the monumental 23-meter tall “Bunjil” is cast aluminium painted white. 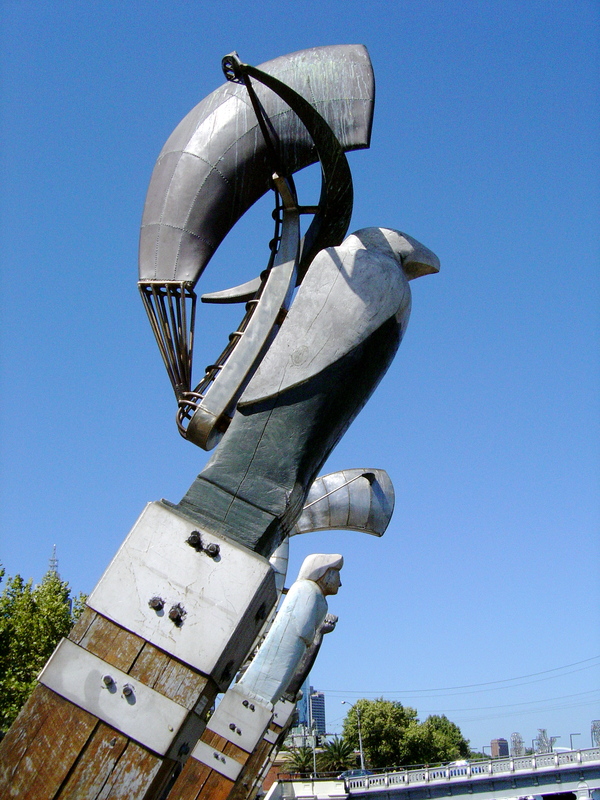 Armstrong’s sculptures are totemic, in a Jungian collective unconscious way; it is serendipitous that his Eagle happens to correspond to the sea eagle creator, Bunjil, of the Kulin Nation. 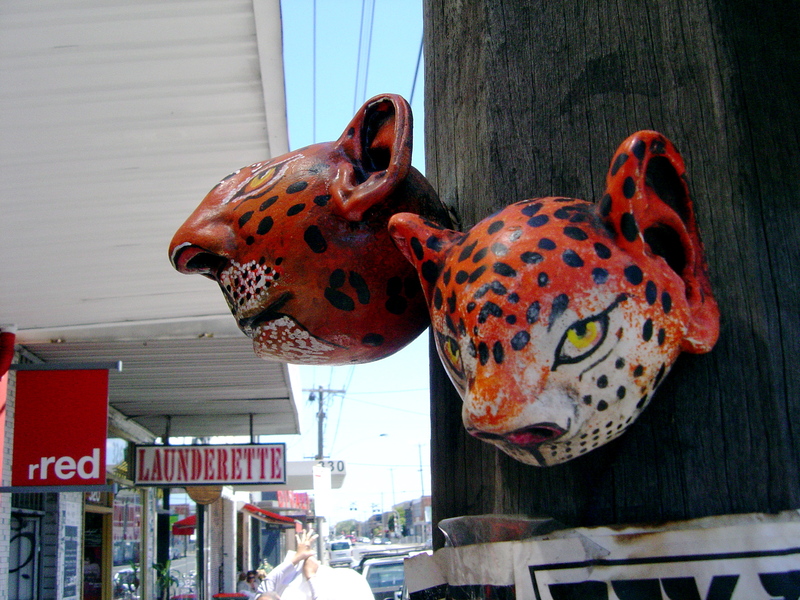 His public sculptures work as totemic features along paths or guarding gateways. And because of their monumentality they are treated with a kind of awe. Melbourne is becoming like Disneyland; years ago John Birmingham pointed this out in his book Dopeland. The spectacle of gas flares outside the casino, buskers, sidewalk artists and sculptures every 500m. I walk along it often; I like pedestrian spaces. I’ve enjoyed meals in the restaurants along it and taken visiting Canadian relatives to this attraction. I’ve also often thought about Birmingham’s “Disneyland” remark. Following a design trend that has worked for many other cities, Melbourne has been rehabilitating its river and docklands areas. The banks of the Yarra River are a designer public space from Birrung Mar down to the Docklands. The designer city came to Melbourne with the arrival of the Casino and the transformation of Southbank. Melbourne’s rehabilitation through designed environments has extended further including the north bank of the river. 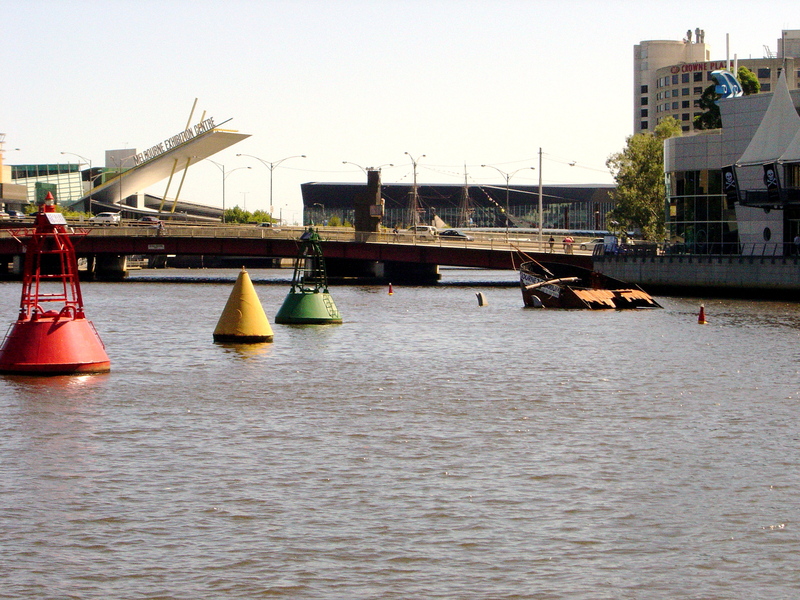 The rehabilitation of the Yarra River’s city foreshore has included a large number of public sculptures. What are these sculptures supposed to do in this designed urban environment? Architecturally the sculptures seem to function only as a way of breaking up the pedestrian spaces. Some sculptures became lost amongst the commercial frenzy of Southbank cafes (see by blog post: Ophelia will return). Sometimes it is hard to determine in this designed environment what is a sculpture and what are sculptural architectural elements or a marketing design concept like the jocular three fins projecting from the river water or the fake half sunk ship outside of the Melbourne Aquarium. Or something else, entirely like the lighting design. Some of the sculptures along the Yarra try to recreate a sense of history in a post-modern way while others are just sculptures in a modern sense, independent of history or reason. There is no consistency in taste or style for the sculpture; novelty is preferred in this environment. Two of these sculptures, “The Travellers” and “Constellation” are about the variety people who have immigrated to Melbourne. 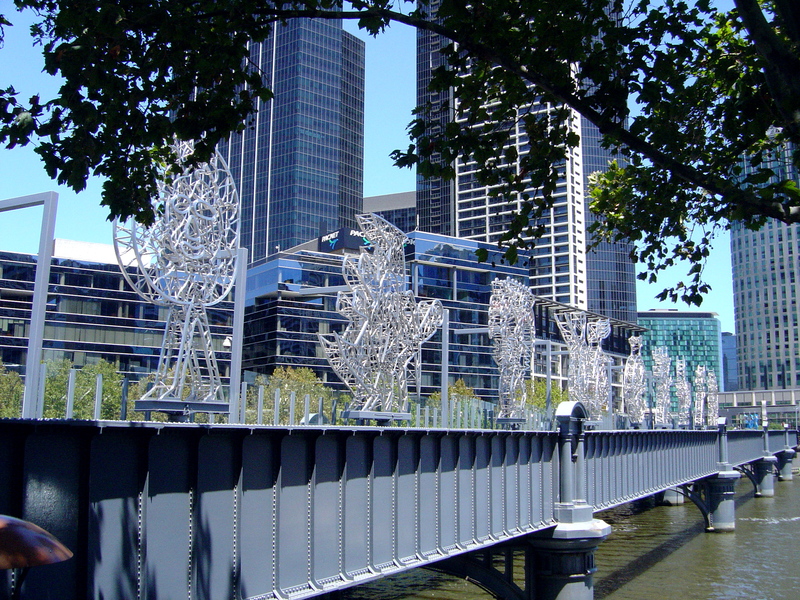 “The Travellers” by Lebanese artist, Nadim Karan (on Sandridge Bridge across the Yarra River) and “Constellation” by Bruce Armstrong and Geoffrey Bartlett (between the King and Queen Street bridges). 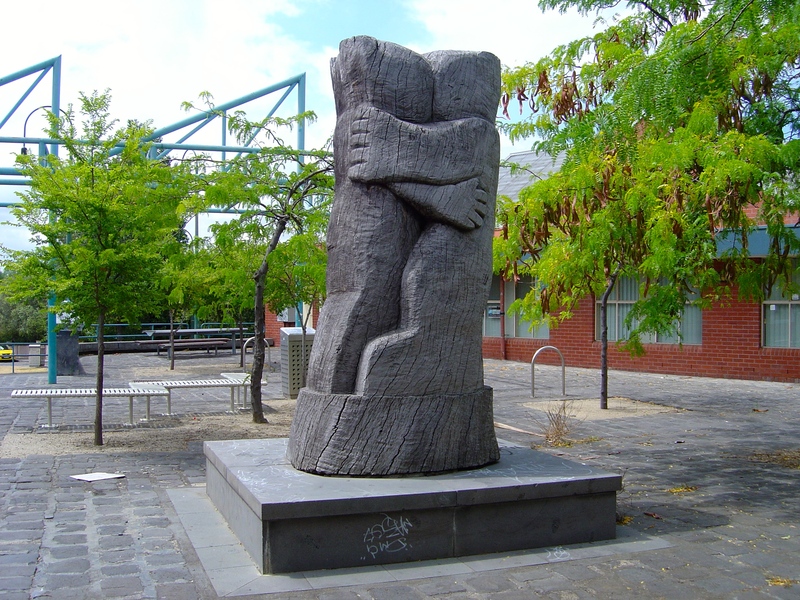 “Constellation” is five large figureheads reflect upon the ethnic and cultural diversity of Melbourne’s settlement. 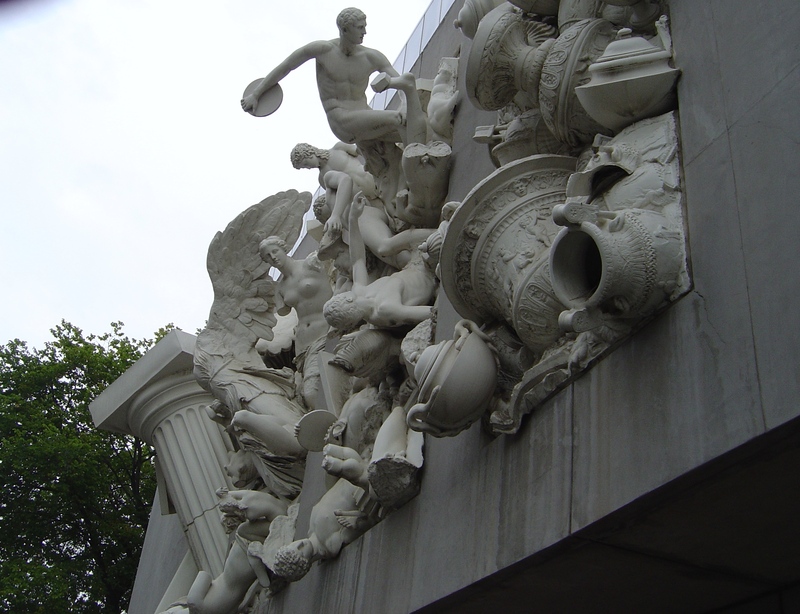 Not that most people would see this in the sculptures; they would merge into the overall design of the area. The shopping mall mentality of urban planning has created a spectacle that although it attempts some signs of authenticity, like the antiques on the wall of chain Irish pubs, only adds to the feeling of hyperreality. Even when the art attempts to connect to the past they only add to the feeling of hyperreality. 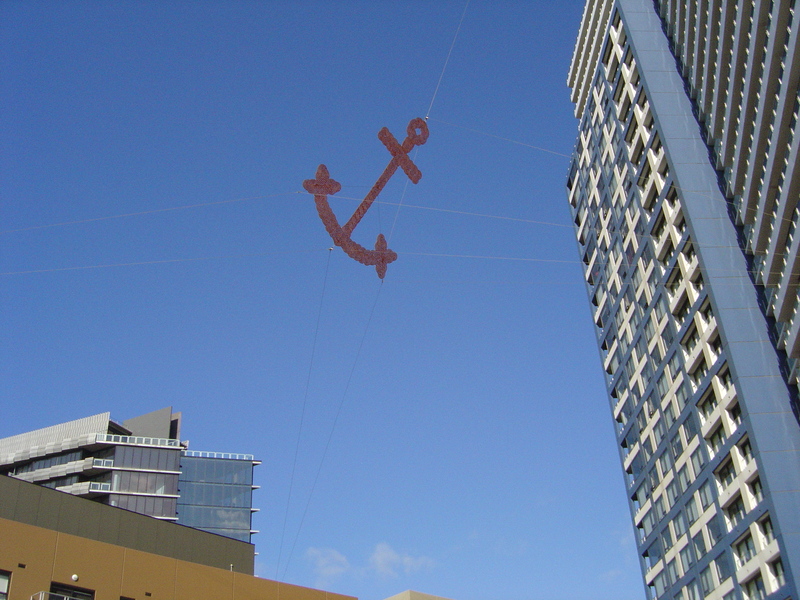 Like the old anchors along the foreshore or the giant knot work anchor suspended over a plaza in outside the Docklands Stadium. I like these many of the sculptures along the Yarra but is this Disneyland the right environment for them?